The practice of preserving plants to form a reference collection dates back to the early 14th century. The earliest surviving example of a herbal (a collection of dried plants with medicinal purposes) dates back to the first century AD. In 1753 Linnaeus published instructions describing the preparation of a herbarium. The principles of this technique are still practised today. Whilst many variations of preparation (pressing, drying and attaching) have been tried, the most significant developments have been in the last 100 years. This has been with the introduction of ventilation to speed up the drying of specimens, the use of synthetic adhesives and more recently, combining practices of other disciples of preservation, i.e. methods and materials used by paper conservators. Botanical specimens (historic and modern) were collected principally to be used. Specimens dating back to the 16th century are still consulted by researchers at the Natural History Museum in London. Herbarium specimens are the essential tools of plant taxonomists. The specimen displaying diagnostic features, together with its label, is a store of unique information about both the individual plant and the species of which it is a member. This information is retrieved in a number of ways ranging from simple visual examination (manually or digitally) to electron microscopy and DNA analysis. NatSCA members (curators and conservators) look at current techniques with regard to reconciling the needs of long-term preservation and the use of specimens as research tools. The group addresses various issues relating to the conservation of historic collections and techniques used in the preparation of new specimens. Mounting and storage methods should take into account that in an active herbarium, mechanical damage to specimens through handling is one of the most significant causes of attrition to the collection. The cross-discipline of NatSCA also facilitates exchange of expertise in other areas of botanical collection management, e.g. dealing with fluid-preserved and freeze-dried collections, environmental storage and IPM (Integrated Pest Management). Associated botanical collections range from plant models and scientific illustrations to ethnographic objects. NatSCA includes members with experience and knowledge relating to these various media. Herbarium specimens are brittle and delicate in their very nature and are subject to a number of dangers over the course of their life; insect attack, damage through poor or changeable storage, handling and of course the constant use that they get from researchers. It is imperative that a specimen is mounted in such a way that not only is it displaying all necessary diagnostic features, but that it is secure enough to last indefinitely. Long series of specimens are essential to science and so the life span of a herbarium sheet must be correspondingly long. It is correspondingly essential that the material be preserved, along with the collection information, in as stable a way as possible. For research purposes, it would be preferable to keep the specimens unmounted as this would allow total access to all parts, however, with careful methodology there is no reason why a specimen should bot be as useful to the researcher when it is mounted, and of course, it will be much safer. This applies not only to the plant specimen itself, but obviates any danger that the label might become disassociated from the specimen. With good materials and careful mounting, a herbarium sheet should last indefinitely. At the beginning of WW2 there were collections in Italy, which dated from the 16th century. The Natural History Museum in London has mounted specimens that date from the 16th century, bound volumes of specimens from Hans Sloane's collection in the 17th century, and herbarium sheets from Captain Cook's first voyage to Australia from the 18th century. All of these have been extensively consulted and yet are still in a good enough condition for future scientific research. Specimens provide the foundation of nomenclature, the basis for identification, the common reference for communication, and the vouchers for floras, as well as for evolutionary and genomic studies. 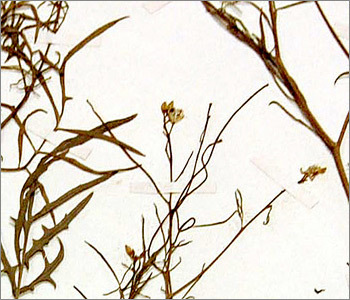 Molecular and morphological characters that allow us to reconstruct the history of life can be obtained from herbarium specimens. All fields of biological science from the level of molecular biology to ecosystem science are dependent on collections, not just for application of names, but as the basis for referencing all aspects of biodiversity.